"Honey and balsamic vinegar add the sweet and tangy aspects of this delicious and nutritious vegetarian side dish or salad!!" Heat oil in large skillet over medium heat. Add onion and cook, stirring, until softened, about 5 minutes. Stir in collard greens, in batches if necessary, until they wilt slightly and all fit in the skillet. Pour in water and cook, stirring occasionally, until bright green and tender, 5 to 7 minutes, regulating heat to prevent burning. Drain. Meanwhile, whisk vinegar, honey, ginger and butter together in a serving bowl for dressing. Add greens to bowl and toss with dressing. Season to taste with salt and pepper; serve warm. i thought the ginger is too strong for greens that already have a pretty strong flavor. i liked the honey and vinegar, though. Absolutely delicious!! Didn't add butter to sauce, and thought it was much nicer, and lower in calories. Great use of collards. Tasty! I didn't use the butter in the sauce, and I added a little garlic with the onions. 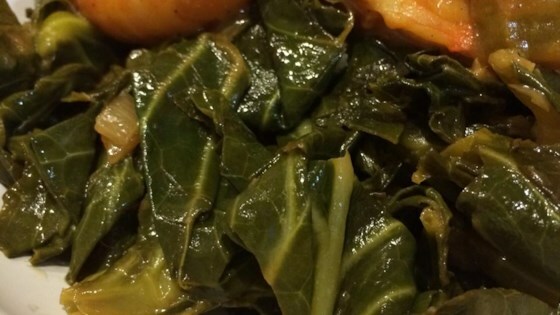 This recipe made me want to go buy more collards!